Am I wrong to be craving soft ginger cookies? After all, it’s my daughter-in-law who is pregnant, not me. Perhaps it’s all the election ads, but soft cookies and milk sound so comforting right now. Or with cider? 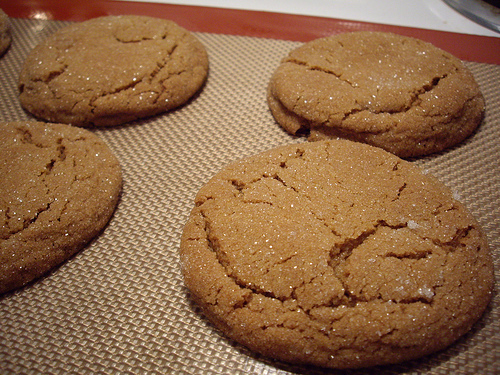 These ginger cookie are hugely popular at All Recipes and are one of the highest rated cookies of any kind there. They are not fancy; they are not cute. They are just comfort food, plain and simple. You can make them now and freeze any leftovers (!) for Thanksgiving or Christmas. The color is perfect for Thanksgiving, but they will be enjoyed on a cookie tray at Christmas too. To keep them soft, store them in an airtight container. Of course it they get more dried out they make good “dunkers.” Yum. I’m thinking these would make a great dessert served with a dish of good vanilla ice cream. That might be just enough dessert after a heavy holiday meal. Wonderful Fall flavor without a lot of fuss that is also inexpensive. I like that. You had to talk about Ginger cookies! I love these things…and am so trying to lose lbs before the holidays.